Here we are at a new venue for myself and quite a few of the people here tonight due to the devastating fire at the Art School, closing the O2 ABC for the foreseeable future, moving to SWG3 and what a nice venue it is too. 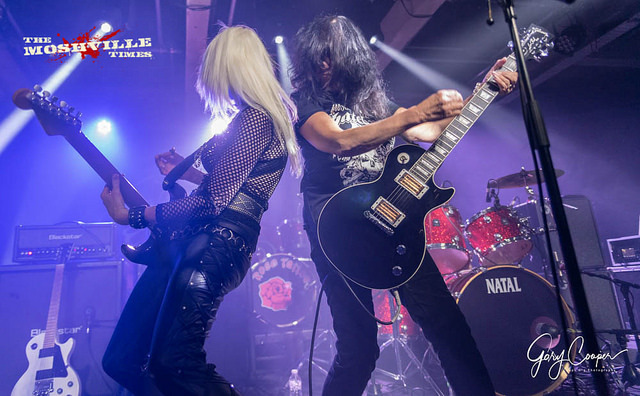 First up tonight we have Girlschool and having seen them many times since 1981’s Hit and Run tour you know you are going to get a great set from the girls, the band are on very sharp at 18:30 but the venue is already busy so the girls get a great reception as they come on stage. The band suffer from dodgy sound throughout their set and you struggle to hear Kim for the first couple of tracks but the band are enjoying themselves with smiles all round from Jackie, Enid and Denise, highlights tonight for me are “Future Flash” and “Watch Your Step” from 1981’s Hit and Run album. The band are on form with Jackie, in particular, on fire on the guitar, Enid is always fun to watch on bass grinning from ear to ear all night, Kim’s voice (when you can catch it) is still as strong as ever. The powerhouse that is Denise in the rear is as solid as ever on classic tracks like “Hit and Run”, “Race with the Devil” and “Demolition”. “Come the Revolution” was nice to hear live from 2015’s Guilty as Sin album plus “Take it Like a Band” from the same album. We get “Kick it Down”, “Yeah Right” and end an all-too short a set due to time restrictions tonight with a killer version of “Emergency”, the sound could have been so much better tonight for the girls but the packed venue loved the band and lets face it who does not love them? You get what it says on the tin, full-on rock ‘n’ roll with Girlschool. Now the band everyone is here to see and with the venue pretty packed out it’s a big cheer as Angry and the boys hit the stage with all the swagger you would expect from these rock ‘n’ roll outlaws from down under. Rose Tattoo go straight in with a killer version of “One of the Boys” from their 1978 self-titled debut album with Angry on fine vocal form, clutching a bottle of Stone’s Green Ginger Wine throughout most of the set tonight. Trying to restrain myself jumping about in the pit taking photos as the band’s groove is just so infectious. The band are rocking it tonight with Dai Prichard in splendid form on the slide guitar which is so much a part of Rose Tattoo’s sound, Bob Spencer on the other guitar rocking it out with none other than Mark Evans on bass and what can I say about Jackie Barnes on drums he just killed it tonight. The swagger continues as we get to one of my favourite albums 1982s Scarred for Life and “Juice on the Loose” with its lazy guitar swagger, boy, the juices are flowing tonight. The riffs on this track are set to make you bounce and smile along with the band as we all sing along to the chorus. We get to see the “Man About Town” and boy is Angry still the man, you definitely cannot pull him down, the band motor on and as the guitar cranks up, we get some “Assault & Battery” and the crowd are bouncing and rightly so, this is just the ultimate party band. We head back to the debut again as the drums crank up the pace and don’t stop as we meet the “Tramp” before we catch up with that “Rock ‘N’ Roll Outlaw” with just the best guitar intro of any boogie song and it’s true, all we need is a rock ‘n’ roll band and we have one of the best on stage tonight. One of my highlights tonight up next is a stunning version of “The Butcher and Fast Eddy” with its slower almost spoken lyrics and that killer guitar riff, this was truly fantastic live tonight. We head back to Blood Brothers now for “Once in a Lifetime” with some truly stunning slide guitar from Dai quickly followed by the stunning “1854” from the same album, you have to love Angry’s voice as it’s just pure molten rock ‘n’ roll. We hear the drums kick in for “Rock N Roll is King” next and never a truer statement, given the quality of tonight’s show from the man’s voice to the quality of the whole band tonight. We get “Branded” now with its darker slide swagger before we meet the “Bad Boy for Love” with it’s rock ‘n’ roll swagger, it’s hard to put into words just how good the boys are tonight. The “Remedy” up next as the guitars kick it up a notch if that is even possible before that voice kicks in with its good time rock ‘n’ roll, a highlight tonight. The guitars kick in as Angry yells “Oh, yeah!” and we get “Scarred for Life”, just quality as we head into a real highlight and favourite for me in the form of a killer version of “Astra Wally” a huge grin on my face all the way through this pure rock ‘n’ roller of a track, full on guitars, killer drums and a voice that would strip paint. The drums and guitar herald never a truer statement “We Can’t Be Beaten” with the crowd in fine vocals during the chorus sections. We sadly get to the end of a truly enjoyable night and what else but “Nice Boys” cranked up and firing on all cylinders; a full-on end to the night. What a night of rock ‘n’ roll, Angry still has that voice and was on fine form all night, the band were just killer and a setlist to die for. I head out into a damp Glasgow night with a huge grin on my face and so many highlights from tonight’s show singing “Astra Wally” to myself. I would urge you all to get out there and see a true rock ‘n’ roll band literally on fire, you will sing, you will bounce and you will have a guaranteed fantastic time. This gig was a really religious experience. Awesome does not even cover it !! I was in tears during Rock ‘n’ Roll Outlaw. Been a fan since 1980. Just made me year that show !!!! !